If you a laptop user, you might find it frustrating when your finger brushes up against the touchpad causing a erratic movement of the cursor.It is annoying as the cursor jumps to some random location on the screen. So , how to turn off this touchpad in laptop to prevent erratic movement of cursor ?? Now click the device Select tab and check "Disable Touch Pad when USB Pointing Device is present.". Now the cursor won't move from touchpad. 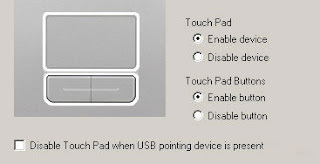 Alternatively, you can disable the touchpad of your laptop by clicking the "Disable Device" in the Touch Pad setting. You can even disable the touchpad from the BIOS setup [press F2 or del when the computer starts to enter BIOS settings]. There are no keyboard shortcuts available for this setting.Moreover some laptops coming now are having a button for locking the touchpad when needed.That might be much helpful as you cant go to control panel every time you type.You can create a shortcut of mouse properties somewhere in your quick launch or start menu for doing the above procedure in a faster way. If you want more tips & tricks , don't forget to subscribe here or click here to get email updates. I have aspire one, vista home edtion but there is no dissable touchpad settings. The only settings available are Buttons, Pointers, Pointer Options, Wheel and Hardware. I still can't dissable my touchpad. I couldn't find the disable the touchpad button so I uninstalled the drivers for the touchpad. It is still working and driving me crazy cuz the cursor jumps all around when I accidentally brush against it. What should I do now to disable the touchpad? maybe we should invent a touchpad that pops out of your loptop and you can use it as a regular mouse. what about for HP windows 7 users. How can i disable and then ENable the touch pad. I have a led at the top left corner that if i touch, the touch pad is disabled. but when i touch it again it does not enable the touchpad again. DOnt knwo what to do. Can anyone help? You would think there would be a disable button under the touchpad settings wouldn't you? Because mine doesn't have it when I have an alternate mouse source. That is quite a hefty server package you have going there. Very glad to hear that all is well with it. It was written when I was got crazy with my VAIO after I tried to turn touchpad off when I connect USB mouse. it toggles both on and off, you need to hold it for a few seconds to enable it. I think that same combo worked on my Sony vaio too. Thanks for the tips. I've been wondering how to disable that annoying touch pad for a while now. I have tried uninstalling the USB Devise and work when i using the mouse.